Posts tagged: When are you going to start doing it? When are you going to get started? In my role as a career strategist, I meet a lot of people who are settling and surviving in their current career while they are waiting and hoping for THAT DAY when they will get to do what they REALLY want to do. It’s not real – It’s just an excuse you use to give yourself permission to stay stuck and settle where you are. Someday is like an untethered kite blowing out of control in the wind. It holds your dream in suspended animation. 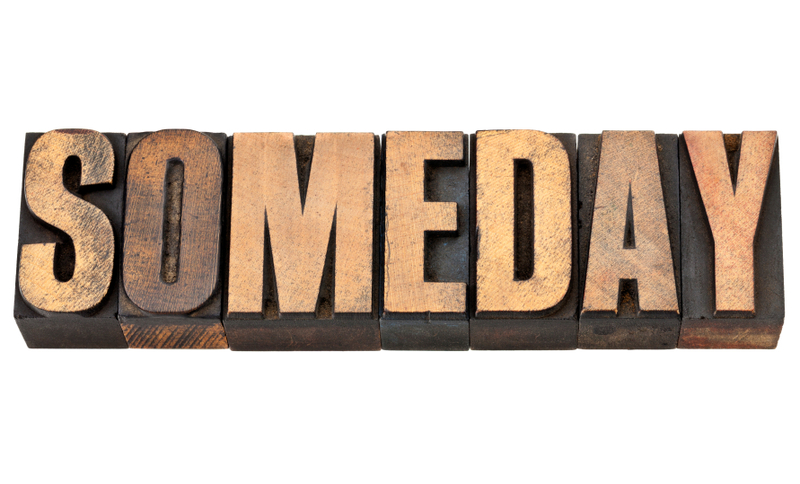 Someday has no deadline – it is infinite. Before you know it your life is over and that someday never came. 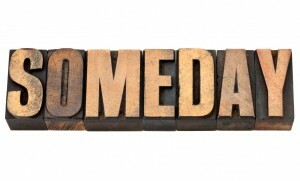 Instead of someday…Why not NOW? Maybe you’re thinking that you’re not ready, perhaps this feels true? I know that if I’d waited to be ready, I’d still be working 9 to 5 in a Bank in East Yorkshire, UK. It was safe and secure! …You might be waiting your entire lifetime for the right time and you’ll never do it. Most people aren’t prepared to invest in their someday. So what they really want stays a dream. Someday comes at a price. How much does someday cost? This was a great question that one of my coaching clients asked me recently. I helped him break it down. Doing what you want to do and living your dream involves personal investment. It’s not just about gathering information, the hardest part is often implementation: taking the steps necessary to bring it to life. This will cost you time, commitment , attitude, and energy (even when you don’t feel like it). It can be hard work and yes, there may be a few sacrifices along the way. One of the biggest obstacles of success is that we get in our own way. We lose the mental fight with our own laziness and ignorance when things feel too hard or difficult. We slip back to our comfort zone because it’s easier settle for what we already have. For most people the price of success is too high. They prefer to settle for an easier life. They aren’t prepared to reach through their fears to find the courage to keep going and keep growing through change or take a few risks. I only get one life. I owe it to myself to make the most of my days here and make each one count. I dare to dream BIG and go deeper than I’ve ever gone. I don’t always know how to do it, but I’ll do it anyway. There will be days where I’ll challenge myself because I want to quit. There will be days where I never knew that my life could be so beautiful. I’m here to make a difference and I’m following my heart. I’m committed to keep learning and growing and leading. I’m honored to do what I do and blessed to notice that the work I’m doing affects the lives of those I serve in such a positive way. Doing what you want to do has its ups and downs like everything in life. It may take more time and effort than you anticipated. It changes your life from deep within. You feel more alive and the returns on you, your family and the people you serve are even bigger than you would even begin to imagine. Allowing, Beliefs, Change, Choice, Commitment, Courage, Decision, Discipline, Elaine Bailey, Excuses, Going Deeper, Growth, Leadership, Learning, Now!, Self Discipline, Self doubt, Success, Taking Action, Thinking, Uncategorized |	 Begin doing what you want to do now, Start do what you want to do, When are you going to start doing it?